The Grand Canyon, carved over the past six million years by the slow, never ending wear of water, is a 277 mile long gash across the northern part of Arizona. 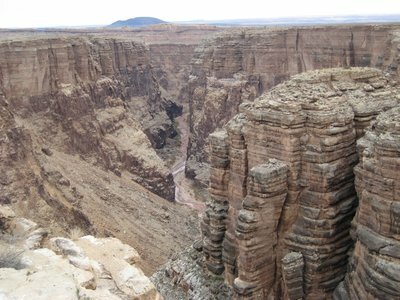 The Colorado River, which was the carving hand of the canyon, runs through its centre on the way to the Gulf of California, more than a mile below the rim of the canyon. 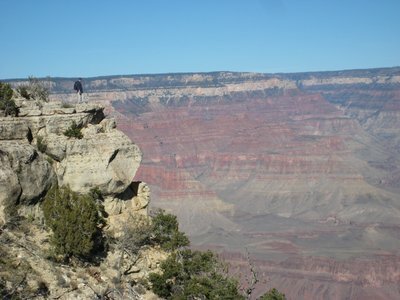 Standing on the rim, it is anywhere from four to ten miles across to the other side. 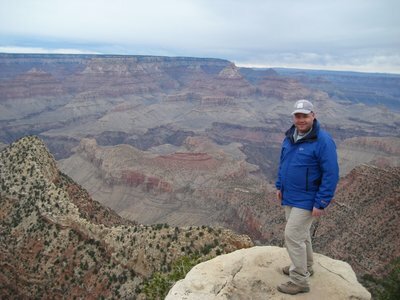 I visited The Grand Canyon this past weekend. 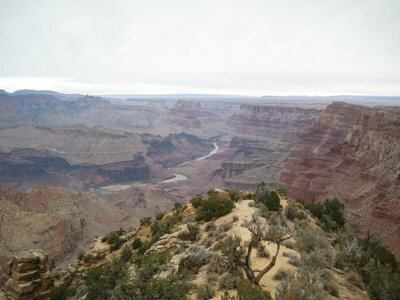 A visit to a site like Grand Canyon doesn’t really generate a coherent narrative that has a beginning, a middle and an end. Instead, I present vignettes of my visit, a series of short scenes to give a flavour of the trip. 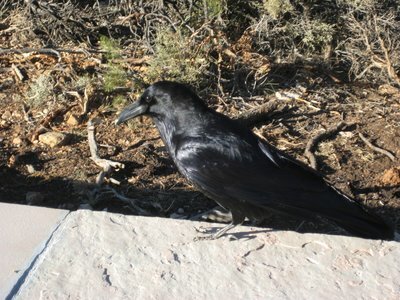 The Grand Canyon is often described in tourist literature as “one of the seven natural wonders of the world.” The literature always seems to fail to mention the source of this claim, or list the other seven wonders of the natural world. In truth, there is no list of the seven wonders of the natural world. Calling the Grand Canyon that is just marketing spin. I like to think I am above getting excited about such things. I’ve seen canyons, waterfalls, empty plains, tall mountains and many naturally wonderful things. I like to think that I have travelled enough that I can demonstrate a certain amount of blasé attitude towards such things. Not so for Grand Canyon. Instead, as the clock ticked by the hours on Friday, I found it harder and harder to concentrate on work. Instead, my brain kept jumping to thoughts of being at The Grand Canyon, and I found my excitement level rising by the hour. I wasn’t the jaded, experienced traveller. Instead, I was the giddy, excited child, about to experience wonderment and awe. 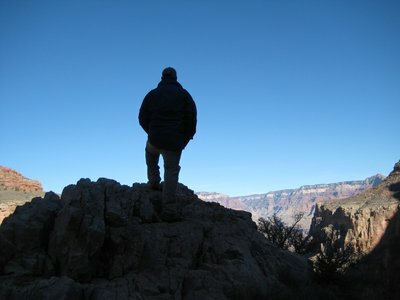 I kept imaging myself standing on the rim, looking out over the canyon. 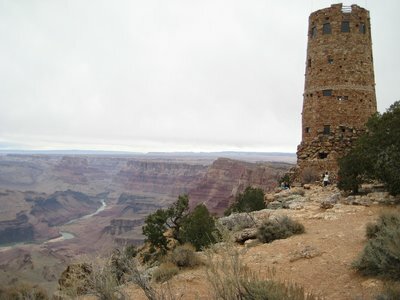 I arrived at Grand Canyon Village, parked the car and wandered up to the rim. There it was, stretched out before me. Excitement and awe weren’t the feelings that found me. Instead, it was a feeling of being small, and young. Standing beside something so big, so old, you can’t help but put things in perspective. Our time here on the earth is so short and so insignificant that it doesn’t even matter. 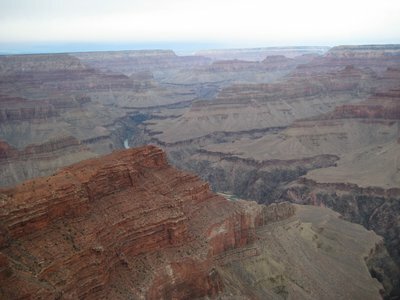 You have neither the longevity of the canyon nor the power of the river that carved it. You are a speck. Of course, returning to work on Monday, all the perspective is lost, and all the problems that seemed to shrink away on Saturday return to their regular size. But for a few moments, it was nice to lose those problems in the depths of canyon’s deepest crevices. 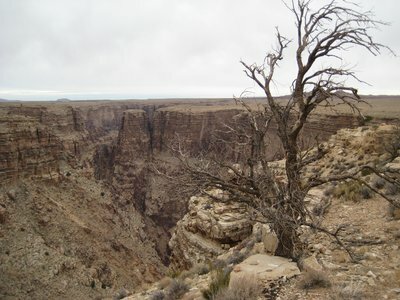 I try and take pictures of the canyon, but it is often too big to fit into the frame. Even when I find a place to fit it all in, the picture that comes out doesn’t seem to capture it. It is big. It is grand. It is constantly awe-inspiring. I can describe it with a million words, but I can’t get a picture of it. So instead, I present this. I try and film it, and put it to music to capture the grandeur of the place. I am not sure it is much better than the pictures, but it is probably a little bit better at capturing the place. 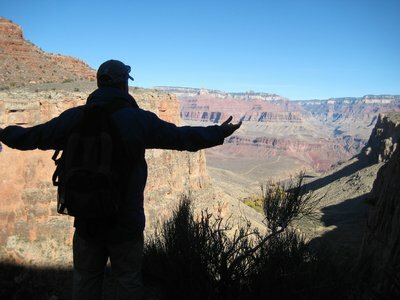 On the south rim of the canyon is Grand Canyon Village. 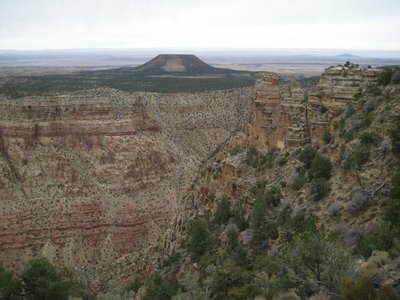 Now the primary spot to see the canyon, it cemented this honour in 1901, when the Sante Fe Railway came to town, making this the easiest place to get at the canyon for early 20th century visitors. The railway depot was completed in 1909, and is built of logs. 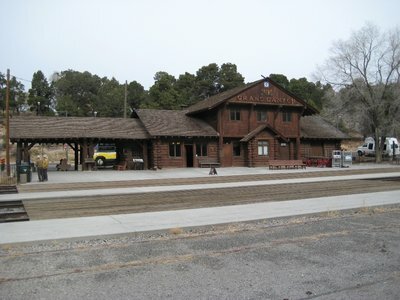 It is one of only 3 existing railway stations in the USA that is made with logs. Though most visitors come to town on bus tours or via car nowadays, the train still comes into town. 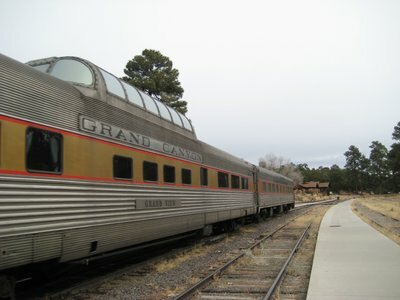 Today it is a tourist trip of 2 hours from Williams, Arizona up to the Grand Canyon Village, offering various classes of service, including a observation car. 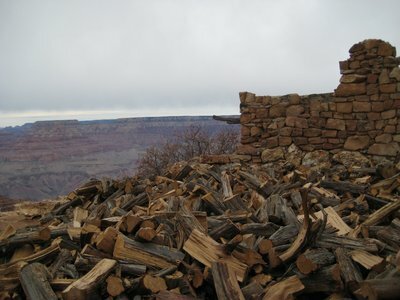 Many of the prime buildings in Grand Canyon Village were commissioned by Fred Harvey. Mr. Harvey opened a number of restaurants along side railway stations and water stops for the stream trains in the late 1800s. As the stops were short, Mr. Harvey’s offerings were offered quickly, feeding an entire trainload of people in 30 minutes. Despite the fast food, the restaurants were clean, the food served on fine china by beautiful young ladies known as Harvey Girls. The restaurants were a success, and spread rapidly, leading to the first restaurant chain. 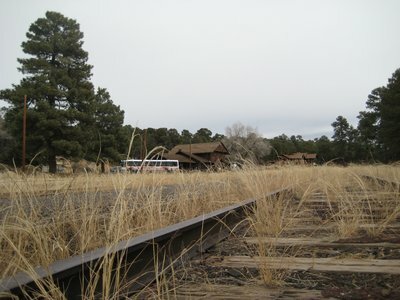 When the Sante Fe Railway came to the Grand Canyon, Fred Harvey came with them. 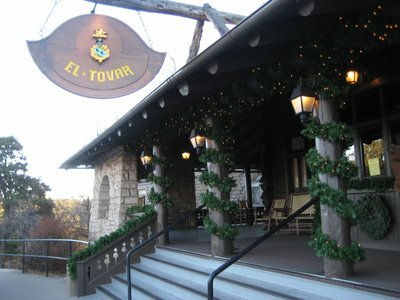 He commissioned the El Tovar hotel, a beautiful stone and log building that mirrored the architecture of the area. 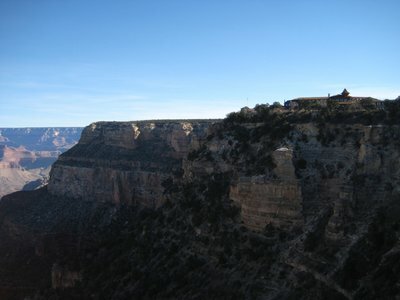 The hotel still operates today, and provides rooms that are just steps from the south rim of the canyon. 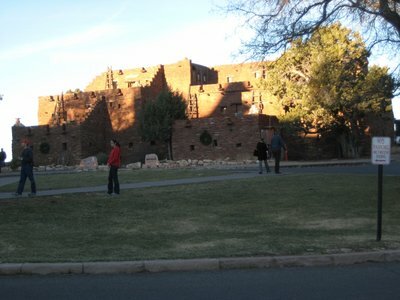 Across from the El Tovar hotel is the Hopi House, typical of the Pueblo buildings in the area. When it opened, it sold curios and had the local natives performing ceremonies and traditional dances. Today, it sells native crafts. 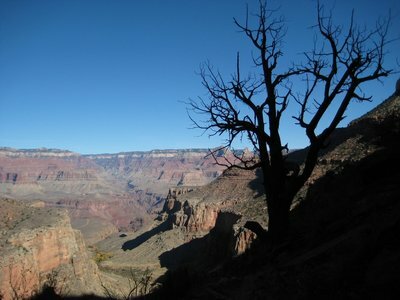 Grand Canyon Village is small, with very few human residents. There are a few non-human inhabitants. 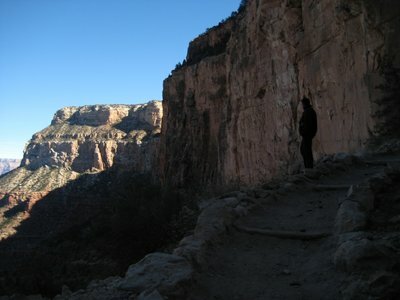 On Saturday, I hiked the Bright Angel Trail. 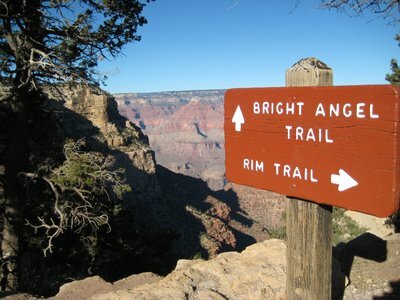 Bright Angel is a trail that runs down into the canyon from Grand Canyon Village. 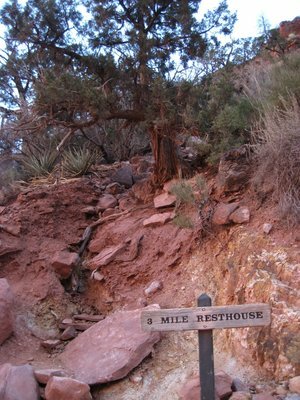 The trail runs down into the canyon for 8 miles before encountering the Colorado River. In those 8 miles, it drops in elevation from 6,860 feet at the trail head to just 2,480 feet above sea level at the river. I wanted to make up for my rather slow plod up Camelback a few weeks ago, so prepared myself for the hike with a good breakfast with a mix of proteins and carbs, and a pack loaded with water, Gatorade, granola bars and raisins. 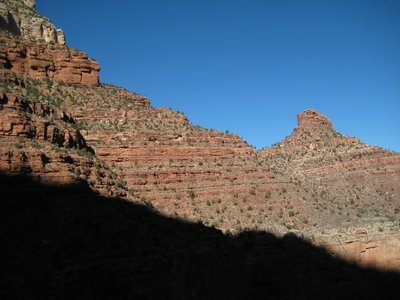 A round trip of 16 miles to the river, or even 12 miles to the look-out at Plateau Point, seemed over ambitious for a single day, but a trip down and back to 3 mile rest-house seemed doable, so that was the plan. 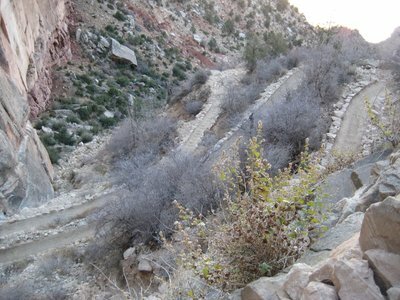 The trail switchbacks back and forth down the canyon as it descends. Being inside the canyon provides a different view of the canyon, from the outside looking in. 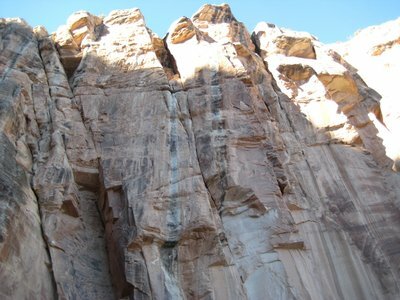 The walls rise up above you, straight up, shear and bright in the sunlight as you hike in the shade. After an hour, I arrive at 3 mile house. I rest up, throwing back a bottle of water, a box of raisins and a granola bar to make sure I don’t suffer the same fate as my hike up Camelback where I felt faint. In the hour that it had taken to get down, we had dropped 2,000 feet in altitude. Climbing back up would require a climb to reclaim those 2,000 feet. No need to worry this time, even though it seems like I am moving slowly, I fly back up in 2 hours, and arrive back up at the top. 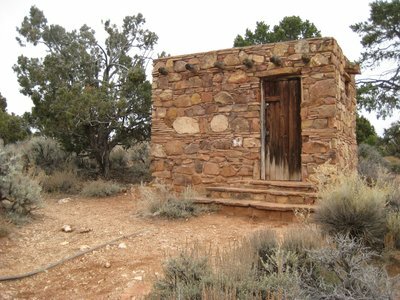 Still feeling energetic, I head out along the Rim Trail, hiking two miles along the rim before returning to Grand Canyon Village. 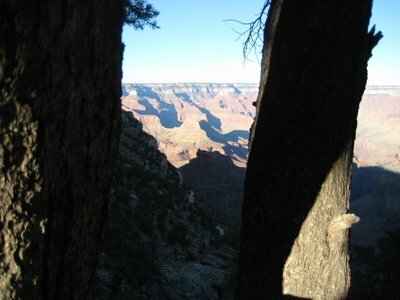 Along the hike, with the sun slowly sinking in the sky, I catch some beautiful shots of the canyon. As I walked along viewing the Grand Canyon over two days, I kept wanting to get pictures of myself in front of the canyon. Part of it is to try and provide some perspective on how large the canyon is by giving a point of reference, but another part is the fact that I am just an egotistical jerk. Walking along at one point, I saw a really nice rock outcrop, and decided that it would be a perfect place to grab a photo of myself. So I handed off my camera and headed out onto the outcrop. I’ll let the video explain the rest. 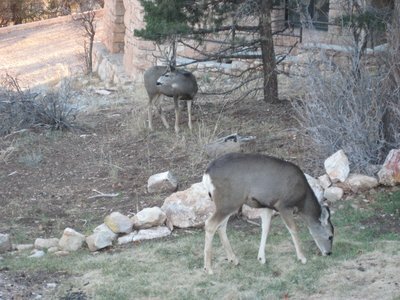 I stayed in Williams, about one hour south of the south rim. It’s a convenient place to stay to visit, providing both a short ride in the morning, but not pricing itself out of my price range. I have recently discovered Priceline and Hotwire as a place to get a cheap hotel. The only problem is that you don’t know what you are getting until you book. As someone who spent the last 10 years travelling for business as a Marriott Rewards Platinum Elite member and constantly booking Marriott hotels, it is a shift to book a hotel blind. But my first experience with the blind booking worked out okay with my hotel in Flagstaff a few weeks ago, so I thought I would give it another try. Unfortunately, I got a rather downtrodden hotel. 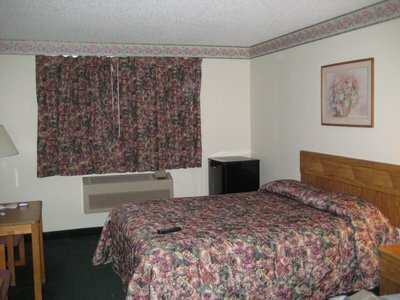 On offer was a drab room off a hallway that smelled like the bottom of an ashtray with a window overlooking the highway. The free breakfast consisted of doughy muffins and cereal. Every time I walked into the hotel, the maids had been in to turn off the heat, and when you are up at over 5,000 feet in December, the weather outside is cold, so the room was always like a freezer. In fact, I would have called the hotel a flea-bag motel, except that the lack of heat in the rooms meant that any insects attempting to live in the place would be frozen to death. Perhaps that was the maid’s plan. Outside of the hotel, Williams itself is a nice little town. 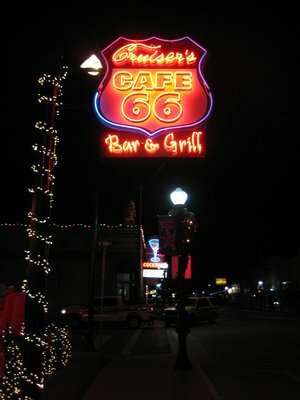 Like Flagstaff, it sits on the historic path of highway 66, the same of the famous song. 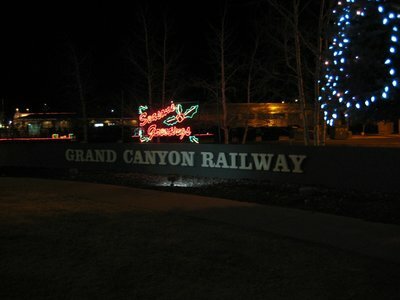 While I was at the Canyon on Saturday, Williams celebrated the coming holiday of Christmas. Returning to town, I saw a number of people walking around in pyjamas. “Am I in a town of mental patients,” I wondered. Turns out that no, I was not. As a tradition, the folks of Williams dress up in their PJs to watch the Santa Claus Parade. Meant to emulate waiting for Santa on Christmas Eve night, I think. 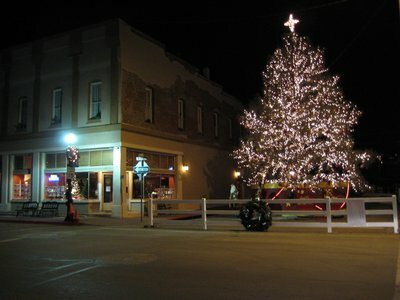 To celebrate the Santa Claus Parade and the upcoming season, the town was decked out in all its holiday finery. Heading east out of Grand Canyon National park, highway 64 parallels a side canyon that holds the Little Colorado River. 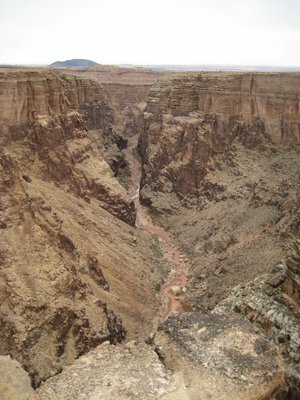 The Little Colorado meets up with the Colorado River before entering the canyon. Despite the diminutive name, the Little Colorado has done a pretty decent job carving its own canyons. 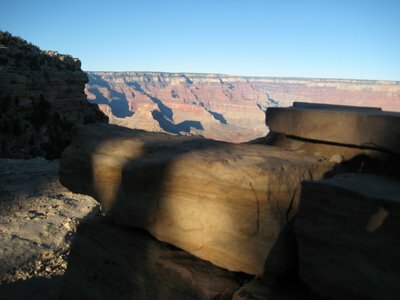 Back in Grand Canyon National Park, some 22 miles east from Grand Canyon Village, is Desert View. Desert View provides some of the best views of the Canyon, I think. Shame that Sunday, when I was there, the sun was refusing to come out at all. Even so, I got some nice views of the Colorado River and grabbed some good shots. It is called Desert View, I suppose because you can see the desert. Built at Desert View is this tower, which is based on a Hopi Indian tower. 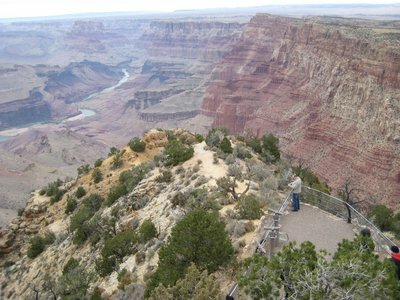 You can go up it and get some views of the Canyon from a bit higher vantage point. 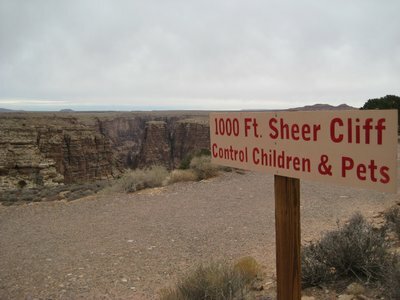 Though, when you are talking about a canyon 10 miles wide and a mile deep, getting up an additional 20 feet in the air doesn’t seem like it would make that big a difference. Back from the rim and the tower are a few other replica Hopi buildings. 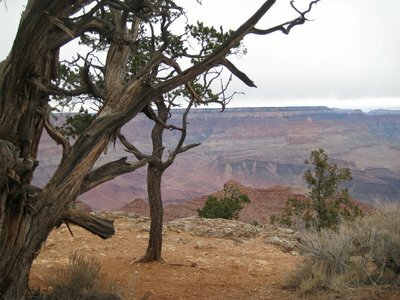 And, as everywhere along the south rim, views of canyon abound. 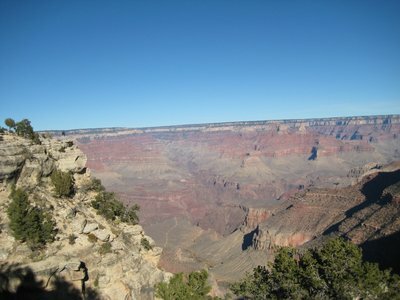 It is a GRAND canyon. 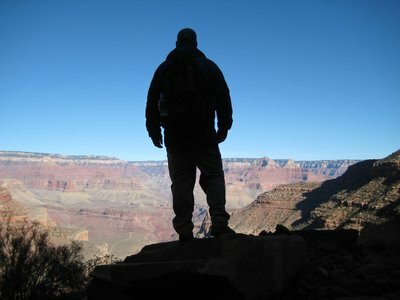 You know, even after all of my time in Arizona, I still haven't been to the Grand Canyon. It looks amazing. The Harvey Girls are the subject of an old Judy Garland musical, which also stars a very young very dangerous Angela Lansbury as a showgirl (well before her Murder She Wrote days). It's fun for a bit of kitsch if you like that sort of thing.